Rising talent: Ali Khalid (r). Mukhtar Mekki hopes to one day watch Ali Khalid and his team-mates play on Pitch 1 at The Sevens Stadium in the main World Rugby Sevens Series. Perhaps Mekki will be proved right and the UAE National Schoolboys final played in front of an impressed main stadium crowd at the Dubai Rugby Sevens on Saturday will serve as a glimpse into the future of Emirati rugby. One thing’s for sure, on this evidence there is no shortage of young, local talent. That is particularly true of 18-year-old Khalid, who danced his way to the try-line in the final seconds to touch down and seal a 17-5 win for Dubai Mixed Schools against Rashid School for Boys. Rashid School actually took the lead in the final but once Dubai Mixed Schools settled into their tricky and skilful style of play, they were difficult to live with. Competing on the main pitch, scoring in and winning the final and lifting the Trophy is a memory Hamdan Bin Rashed High School pupil Khalid will carry with him forever. “I feel so happy but we are a whole team and the win is down to the team. We are happy that we came back from going behind on the scoreboard,” said Khalid, who hopes for rugby to one day become his country’s most popular sport. “I am so happy and excited to be here and seeing all these people watching me play. It will be a good souvenir for me,” he said. Team coach and Khalid’s teacher, Mekki, was the man who first introduced the youngster to rugby. “I am his teacher and brought him to this game. Perhaps we will see him and some of the boys in the main men’s final one day, why not,” he said. “You saw him, he can be, he is able but he has lots of work to do and must be persistent. What was your favourite moment of the Dubai Sevens? Over 100,000 fans from all over the world enjoyed the long weekend at the Emirates Airline Dubai Rugby Sevens. The successful rugby extravaganza event saw 28 international teams compete in the HSBC World Rugby Sevens Series and the Women’s Sevens Series, 245 invitation teams in the Invitation Tournament and 24 netball teams in the new Netball competition – record breaking numbers for the 46th edition of the tournament. The overall winner of the opening round of the series was Fiji, beating England 28-17 in the Cup final. Meanwhile, Australia claimed the Women’s Sevens Series title, beating Russia comfortably on a score line of 33-12. Despite losing their inspirational captain Sharni Williams to injury on day two, the girls in gold remained unbeaten throughout the tournament. Key highlights of the weekend included guest appearances from All Blacks star Sonny Bill Williams and the largest Invitation tournament to date. Organisers are already looking ahead to next year with plans to expand even further in order to keep attracting the crowds to the largest sporting event of the year. Happy in Dubai: Ben Ryan (r). 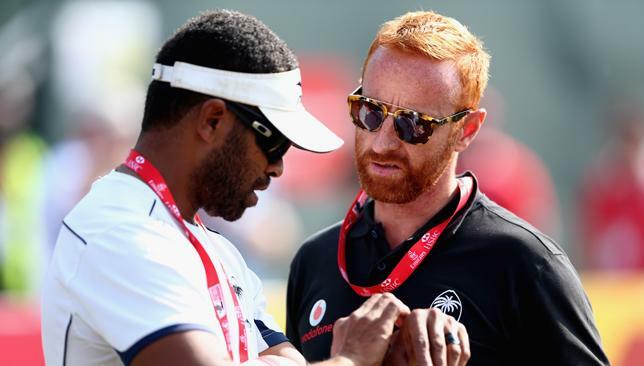 Fiji’s English head coach Ben Ryan has lived in the Pacific Island nation for the last two years, although Dubai is becoming like a home from home for him. A 28-17 Fiji win against the country of Ryan’s birth and the team he managed for six years last night gave the 44-year-old his fourth triumph at the Dubai Rugby Sevens in the last six years and got his team’s HSBC World Rugby Sevens Series title defence off to the perfect start. Savenca Rawaca, Isake Katonibau, Jasa Veremalua and Jerry Tuwai tries saw Fiji claim the Cup for the second time under Ryan as the reigning series champions drew first blood in the 2015-16 edition. Fiji finished runners-up at Dubai six out of the first 13 years after the World Series was introduced in 1999. Since their maiden win in 2013, however, Ryan admits the Emirates has held special significance for his team. “I enjoy everything about Dubai,” said Ryan. “I’ve got some good friends who live in Abu Dhabi and Dubai. The boys enjoy the temperature too so we have absolutely no excuses. Despite enjoying a perfect start to a title they wrestled from New Zealand’s vice-like grip last year following four straight victories, Ryan knows a difficult season lies ahead. “It’s good to win the opener but I’m sure there will be plenty of ups and downs,” he said. Ryan was also critical of his team, who he feels can be their own worst enemy on occasion. “There was a golden five minute period out there (in the final against England) and that was it,” he said. “The second half was pretty flat and England were better than us but that five minutes was enough. I definitely think being complacent is a threat we need to have a look at. A thought has to be spared for Sir Gordon Tietjens and his New Zealand side, who despite making it to the Cup semi-finals, were besieged by injuries all weekend. They suffered the ignominy of being beaten twice over the two days by a rapidly improving USA side, although the All Blacks finished the third/fourth-place play-off game against the Eagles with five men. “I’ve never been in a tournament where I’ve been so decimated with injuries,” said Tietjens. “Even in the last game we played for third, Sherwin Stowers broke his arm. DJ Forbes has been playing on an injured knee, Joe Webber’s got a shoulder injury. Scott Curry, the captain’s, out with a shoulder injury, Tim Mikkelson with a head injury. Gillies Kaka with an ankle injury, Regan Wear with an ankle injury. “We were playing the USA with six men, five at one stage when someone got yellow carded. It’s just unbelievable bad luck with injuries. Defending Dubai champions South Africa only lost one game all weekend but that put them out at the quarter-final stage, a 21-19 defeat to a perhaps a newly emerging sevens superpower the USA seeing them start the season on a sour note. Star man Werner Kok, however, is not reading too much into it. “It’s the first tournament of the season, things like that happen, it’s sevens rugby,” said the 22-year-old, whose team did go on to claim the Plate following a 19-14 sudden death victory over Australia. Elsewhere, France claimed the Bowl with a 24-14 win against Scotland and Canada beat Japan 19-17 to win the Shield.